Office of the Inspector General of Police, Northern Sector, Central Reserve Police Force (CRPF) has released notification for the recruitment of 570 Head Constable/ GD, Constable/ GD vacancies against Sports Quota. Application Fee: Candidates have to pay Rs. 50/- through Crossed Indian Postal Order/ Demand Draft/ Banker’s Cheque in favour of DIGP, GC CRPF, New Delhi. Selection Process: Candidates will be selected based on Identity check, Checking of Testimonials/ documents, Physical Standard Test, Sports Trial Test, Medical Examination, interview. How to Apply: Eligible candidates may send their application on foolscap paper in the prescribed format affixing attested passport size photograph on it along wth admit card affixing attested passport size photograph on it, attested copies of all required documents, two self addressed envelopes of size 23 x 10 cms duly affixed with postage stamp of Rs. 5/- to The DIG GC-CRPF, Jharoda Kalan, New Delhi-110072 on or before 30-12-2015 & 14-01-2016 for remote areas. 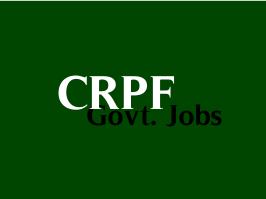 Superscribe the envelope as “Application for the Recruitment of Sportsperson in CRPF against Sports Quota-2015″.